The 2015 MTV Movie Awards in Los Angeles, California and the 2015 Olivier Awards in London, England, both hosted Sunday night (April 12), brought out an eclectic mash-up of style statements from the leading guys. Here, a roundup of their looks. Michael B. Jordan: One of the more memorable menswear ensembles at the MTV Movie Awards, the actor was mad for plaid. Some might call the actor’s Vivienne Westwood MAN Fall 2015 suit crazy, but I call it downright cool. He topped off the look with Givenchy shoes and a Montblanc watch. Chiwetel Ejiofor: Looking regal and refined in a dunhill tuxedo, the actor struck a traditionally classic style note at the Olivier Awards. Zac Efron: The MTV Movie Awards’ Best Shirtless Scene winner covered up in a sporty, quilted Lanvin jacket, which no doubt had many wishing that he’d skipped the white T-shirt underneath. Miles Teller: The actor and triple nominee wore a Brioni ensemble with Christian Louboutin shoes, accessorized by a Montblanc watch and Ray Ban shades at the MTV Movie Awards. Better suited to a casual Friday at the office, the look had me stifling a yawn. 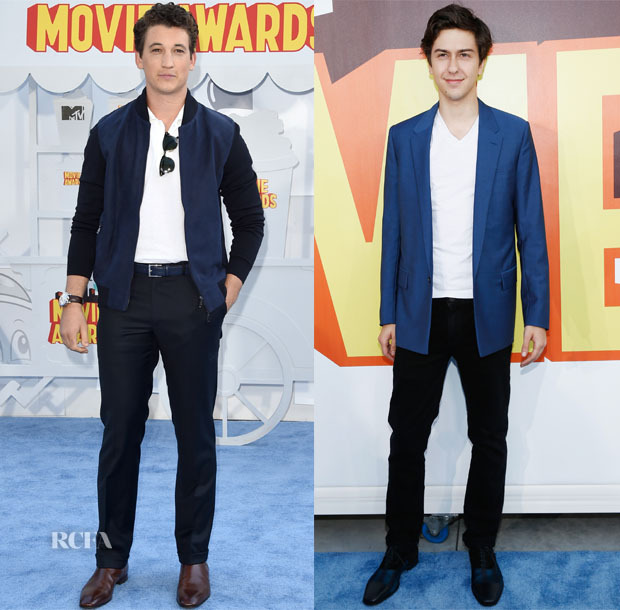 Nat Wolff: Not even the electric-blue hue of Nat’s Balenciaga Spring 2015 blazer could ignite this look that fell flat at the MTV Movie Awards. It could have used a more polished button-up shirt in fun pattern in place of that uninspiring, loose white tee.